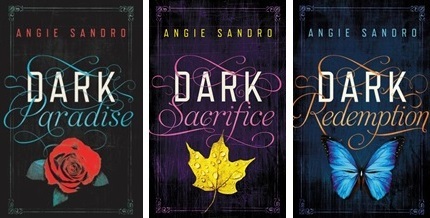 I’m so excited to be part of the launch day blitz for Dark Sacrifice! I’ve really been enjoying these books, and I think many other readers will, too. Mala LaCroix sees dead people -really. After using her psychic gifts to catch a killer, she’s locked in a psych ward and must strike a deal with the devil to secure her release. Apprenticed to a dark arts practitioner, Mala vows to free herself and save her loved ones from danger. But she doesn’t know who to turn to when her crush on Landry Prince turns into something more serious. Landry has sacrificed everything to protect Mala. A near-death experience changes him forever, and now he, too, possesses supernatural powers he doesn’t understand. Mala and Landry must band together to defeat the dark forces-both human and otherworldly-who would use their abilities for evil. Even as they fall for each other, they must prepare to battle for their very souls . . .
Angie Sandro was born at Whiteman Air Force Base in Missouri. Within six weeks, she began the first of eleven relocations throughout the United States, Spain, and Guam before the age of eighteen. Friends were left behind. The only constants in her life were her family and the books she shipped wherever she went. Traveling the world inspired her imagination and allowed her to create her own imaginary friends. Visits to her father’s family in Louisiana inspired this story. Angie now lives in Northern California with her husband, two children, and an overweight Labrador.